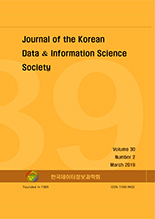 김형태, 김수환,(2019).데이터마이닝 기반 육군 수리부속 수요예측.한국데이터정보과학회지,30(2),429-444. 우리 군에서 사용하고 있는 수리부속은 약72만 종으로, 연간 예산은 전체 국방예산의 3% (약1.3조원)을 차지하고 있다. 이와 같은 예산이 집행됨에도 불구하고 현재 우리 육군의 수리부속 예측정확도는 품목기준 70%, 수량기준 60%를 보이고 있으며, 이는 목표 장비가동률 저하에 악영향을 미친다. 따라서 본 연구에서는 수리부속 수요예측 정화도 제고를 위해 현재 육군에서 운용중인 장비정비정보체계 시스템의 에이타킴스 (ATCMS), K-9 자주포, ARTHUR-K 총 3개 장비에 대한 2012~2016년까지의 ASL (authorized storage list) 598개 수리부속 품목의 연도별 소모개수, 표준단가의 데이터 수집을 통해 데이터마이닝 예측모형 (회귀나무, random forest, 인공신경망, 다중선형회귀)을 활용하여 2017년 수요 (Y)를 예측하였으며, 예측력척도는 RMSE (평균제곱근오차)와 MAE (평균절대오차)를 사용하였다. 연구결과 데이터마이닝 예측모형이 현재 육군에서 활용중인 시계열 예측 모형에 비해 예측정확도가 높았으며, 이어서 K-means 군집분석을 통해서 예측정확도를 더욱 높일 수 있는 군집을 찾을 수 있었다. Recent the development of science and technology, weapon systems have been upgraded and the cost of introducing, operating and maintaining the weapon systems has greatly increased. However, defense spending is limited, and the operational burden of army equipment is continuously increasing in order to cope with North Korea’s constant threats. Therefore, the ARMY needs precise demand forecasts for the spare parts in order to maintain proper operational availability under budget constraints. This is a study to develop a model for predicting of the 3-equipment including k-9. In order to do this, we collected the data that affected the demand for the spare parts using DELIIS (defense logistics integrated information system). The objective variable is the quantity of spare parts in 2017 and RMSE (root mean square error), MAE (mean absolute error) are used as the predictive power measure. To construct an optima demand forecasting model, regression tree, random forest, neural network and linear regression model were used an data mining techniques. The model construction results showed that RMSE, MAE value was the best in the random forest model and the predicted quantity was also highest in the scatter plot.